One of the most common and challenging tasks for any application involves persisting and reading information to and from a database. 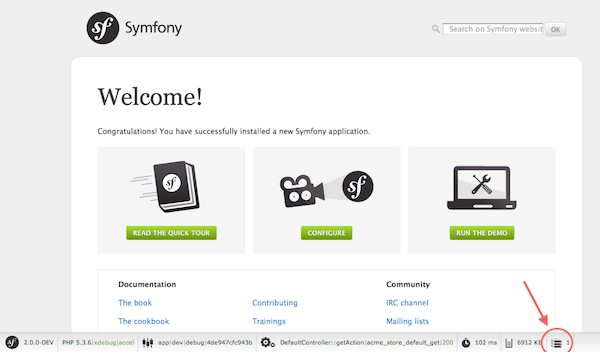 Fortunately, Symfony comes integrated with Doctrine, a library whose sole goal is to give you powerful tools to make this easy. In this chapter, you'll learn the basic philosophy behind Doctrine and see how easy working with a database can be. Doctrine is totally decoupled from Symfony and using it is optional. This chapter is all about the Doctrine ORM, which aims to let you map objects to a relational database (such as MySQL, PostgreSQL or Microsoft SQL). If you prefer to use raw database queries, this is easy, and explained in the "How to Use Doctrine's DBAL Layer" cookbook entry. You can also persist data to MongoDB using Doctrine ODM library. For more information, read the "/bundles/DoctrineMongoDBBundle/index" documentation. You can also check out Doctrine's Basic Mapping Documentation for all details about mapping information. If you use annotations, you'll need to prepend all annotations with ORM\ (e.g. ORM\Column(..)), which is not shown in Doctrine's documentation. You'll also need to include the use Doctrine\ORM\Mapping as ORM; statement, which imports the ORM annotations prefix. When using another library or program (ie. Doxygen) that uses annotations, you should place the @IgnoreAnnotation annotation on the class to indicate which annotations Symfony should ignore. This command makes sure that all of the getters and setters are generated for the Product class. This is a safe command - you can run it over and over again: it only generates getters and setters that don't exist (i.e. it doesn't replace your existing methods). Doctrine doesn't care whether your properties are protected or private, or whether or not you have a getter or setter function for a property. The getters and setters are generated here only because you'll need them to interact with your PHP object. lines 9-12 In this section, you instantiate and work with the $product object like any other, normal PHP object. line 14 This line fetches Doctrine's entity manager object, which is responsible for handling the process of persisting and fetching objects to and from the database. line 15 The persist() method tells Doctrine to "manage" the $product object. This does not actually cause a query to be made to the database (yet). line 16 When the flush() method is called, Doctrine looks through all of the objects that it's managing to see if they need to be persisted to the database. In this example, the $product object has not been persisted yet, so the entity manager executes an INSERT query and a row is created in the product table. In fact, since Doctrine is aware of all your managed entities, when you call the flush() method, it calculates an overall changeset and executes the most efficient query/queries possible. For example, if you persist a total of 100 Product objects and then subsequently call flush(), Doctrine will create a single prepared statement and re-use it for each insert. This pattern is called Unit of Work, and it's used because it's fast and efficient. Doctrine provides a library that allows you to programmatically load testing data into your project (i.e. "fixture data"). For information, see /bundles/DoctrineFixturesBundle/index. The AcmeStoreBundle:Product string is a shortcut you can use anywhere in Doctrine instead of the full class name of the entity (i.e. Acme\StoreBundle\Entity\Product). As long as your entity lives under the Entity namespace of your bundle, this will work. If you're comfortable with SQL, then DQL should feel very natural. 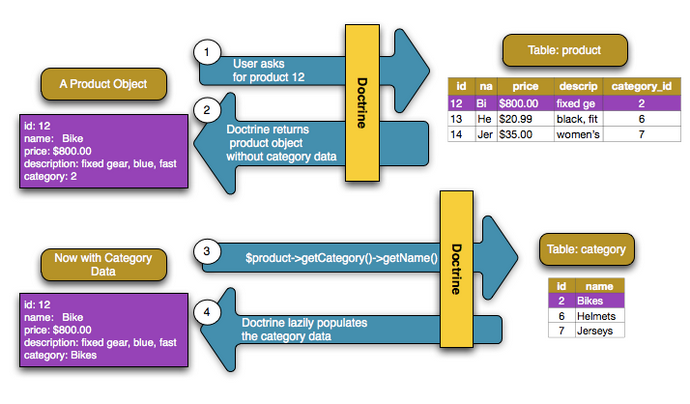 The biggest difference is that you need to think in terms of "objects" instead of rows in a database. For this reason, you select from the AcmeStoreBundle:Product object and then alias it as p (as you see, this is equal to what you already did in the previous section). The DQL syntax is incredibly powerful, allowing you to easily join between entities (the topic of relations will be covered later), group, etc. For more information, see the official Doctrine Doctrine Query Language documentation. Next, add a new method - findAllOrderedByName() - to the newly generated repository class. This method will query for all of the Product entities, ordered alphabetically. $ php app/console doctrine:generate:entity --entity="AcmeStoreBundle:Category" --fields="name:string(255)"
This task should only be really used during development. For a more robust method of systematically updating your production database, read about Doctrine migrations. If you need to do some heavier lifting - like perform logging or send an email - you should register an external class as an event listener or subscriber and give it access to whatever resources you need. For more information, see How to Register Event Listeners and Subscribers. Doctrine comes with a large number of field types available. Each of these maps a PHP data type to a specific column type in whatever database you're using. For each field type, the Column can be configured further, setting the length, nullable behavior, name and other options. 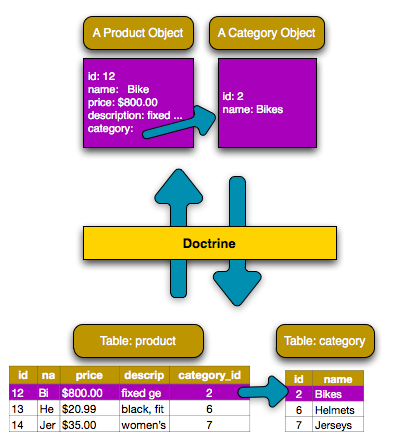 To see a list of all available types and more information, see Doctrine's Mapping Types documentation. With Doctrine, you can focus on your objects and how they're useful in your application and worry about database persistence second. This is because Doctrine allows you to use any PHP object to hold your data and relies on mapping metadata information to map an object's data to a particular database table.